Yin deficiency patterns including menopausal hot flashes, soreness and weakness in low back, fatigue, sexual dysfunction and diabetes are some of the imbalances satisfied clients have used this product for. Rehmannia Six Combination is a great and famous Jing tonic, widely used by older people to nourish the Kidney functions. Rehmannia Six Combination is extremely popular in the Orient. It is used as a Yin tonic, especially to nourish the Kidney and to tonify its many classical functions. 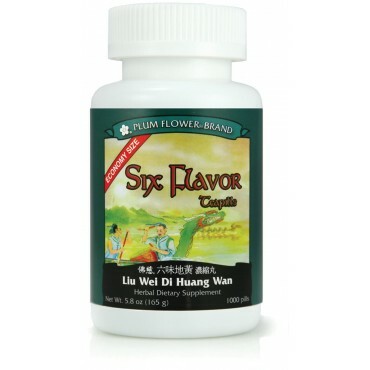 It is often used as an adjunctive formula for people who want to take a more yang tonic and who need to protect against overheating from the yang formula.